Michael Johnson won 4 Olympic gold and 8 World Championship gold medals. He holds the 400m world and Olympic records. His 200m time of 19.32 at the 1996 Summer Olympics stood for 12 years. Johnson is considered one of the greatest sprinters in history. He is the only male athlete in history to win both the 200 meter dash and 400 meter dash events at the same Olympics, a feat he accomplished at the 1996 Summer Olympics in Atlanta. 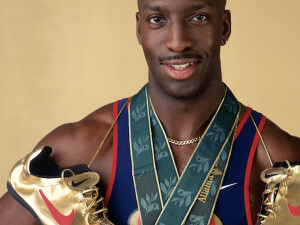 He holds the world’s best time at the 300 m. Johnson is also the only man to successfully defend his Olympic title in the 400 m. Aside from his Olympic success Johnson accumulated eight gold medals at World Championships, and is thus tied with Carl Lewis and Usain Bolt for the most gold medals won by any runner in history. Post athletic career, Michael is CEO of MJP (Michael Johnson Performance) A world renowned athletic training business.